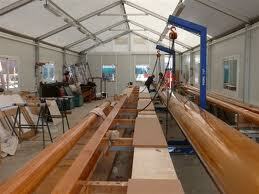 Today’s spars are usually made of composite carbon fiber or aluminum extrusions. Both of these mast materials, just like old wooden masts, require a finish. Whereas wooden masts were typically coated with a clear varnish, they could also be found painted. These more traditional finishes were typically brush applied or rolled and tipped. Spray finishes became more popular towards the end of the wooden spar era. The paints and varnishes of old were also oil-based instead of being polyester-based, like many of the high end finishes found today in the marine or aeronautical industries. application. 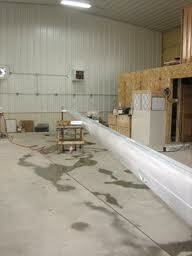 Aluminum however, always requires an epoxy-based primer before applying the top-coat to the aluminum spar. The epoxy primer provides a superior moisture barrier as-well-as, a surface to improve the adherence of the urethane, which is crucial for UV resistance. Although it can’t hurt, a carbon spar does not require an epoxy primer as the epoxy used to laminate the carbon fibers (along with a good etching) ensures quality adhesion by default. Using a clear urethane on a carbon fiber or wooden spar gives the mast a really unique and glossy look that magnifies the patterns within the laminate or the grain. However, this type of finish is more tedious to execute, requires more maintenance and has a shorter life span than its pigmented counterpart. Aluminum masts can also be found in a black or clear-anodized finish, which is preferred due to its durability, but may not always be available. 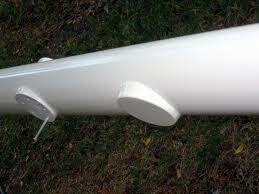 Aluminum spars are also most often painted, typically in either black, or some shade of white/cream. Although rare, aluminum spars can be powder-coated, which has also proven to be a fairly durable finish. We have found powder coating to be the least preferred method for spar finishes. So why does one need to have a finish on these various types of spar materials? Wood will deteriorate from moisture and sunlight. Carbon fiber by itself, does extremely well in a high U.V. environment. However, the epoxy used to laminate the fibers is very sensitive to sunlight and will break down. Unfinished aluminum can be highly corrosive. Carbons, salts, and electrolytic activity in combination with dissimilar metals are some of the factors that can help accelerate this corrosion process. All types of spars (PRE-PAINT-PREP) should have the hardware removed, cleaned, inspected, and replaced if necessary (don’t cheat yourself in leaving on any hardware). Note: remember that the purpose of a refinish is to refurbish and preserve the spar material and the associated hardware. 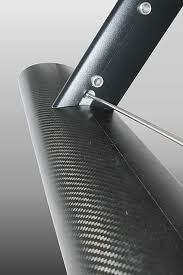 Carbon-fiber spars (PAINT-PREP) will simply require a good etching with a medium-fine grit paper, such as a 220 or 320. Follow that with a good rinse (with a de-greasing soap) along with a chemical wipe just before painting. 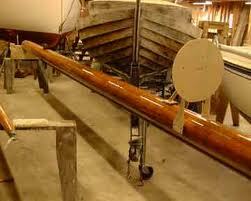 Wooden spars (PAINT-PREP)should also be finish-sanded to a medium-fine grit, such as a 220. You can then use wood bleach or oxalic acid to brighten and clean the wood if applying a clear finish. Be sure to rinse the this acid with vinegar to neutralize it and remove any residue that may conflict with the finish adhering properly. A tack cloth should be used just prior to applying the finish to remove any remaining unwanted dust and/or particles. Wooden and carbon-fiber spars (CLEAR COATS), when applying a clear finish to either, you should take extra care to remove all of the old finish, otherwise this could lead to a “spotty” finish. Aluminum spars (PAINT-PREP)should be sanded to a rougher, medium grit of 120 to give the metal a well-etched surface for the primer to ‘bite’ into. Any highly corroded areas should be spot treated via media blasting. The metal should then be washed with an acid solution to combat the basic nature of the corrosive process. This process will also remove any grease, oil and dirt from the surface, for the primer and the topcoat to adhere properly. A good chemical wipe or tack cloth is also a good idea right before applying the primer. After the spars have been painted properly, you should take extra care to ensure that all of the hardware gets installed using new fasteners and sealant. This step will provide a seal and a barrier between the hardware and the spars. Maintaining these finishes will ensure the longevity of the spars and is achieved by re-coating the spars within the time period recommended, as per the paint manufacturer’s requirements. 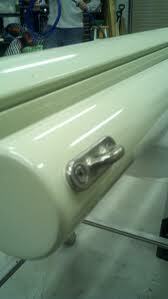 When re-coating you should also remove, re-bed and refasten the hardware associated with the spar. If the existing base coat is intact and meets the manufacturers adhesion requirements, these finishes can typically be dulled with a medium-fine grit like 320 and red Scotch-Brite. Then follow the aforementioned rinsing methods (for Carbon Fiber) and apply another series of coats, as needed. In conclusion, typically (at least in the middle-Atlantic type regions), one can expect pigmented polyurethane finishes to last 7-10 years or longer; non-pigmented polyurethanes may last up to 5 years. In most cases, these finishes could be re-coated within those periods. Granted, these are generalizations and are dependent upon the product used, the geographical location and use, as well as the method in which they were applied. As always, please seek the help of your local rigger or marine painter for specific instructions on dealing with your spars particularly. 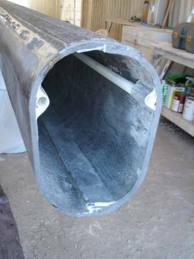 Want to inquire about having your spars refinished? Leave us a note below or reach out to us via our Online Work Request Form. This is a great post. However, I would like to ask more about using powder coating to spar finishes. Why is it the least preferred? Thank you! The main reason, in our opinion, is corrosion creep. With powder-coating once the corrosion starts between the finish and the aluminum it tends to propagate quickly to the surrounding areas, flaking off the finish in large pieces. The epoxy primer (prior to painting) provides really good surface adhesion as well as being a great moisture barrier. The paint and primer method seems to keep the corrosive activity more centralized to one area and the paint flakes smaller. Therefore we believe this to also make the adhesive quality of the finish last longer. 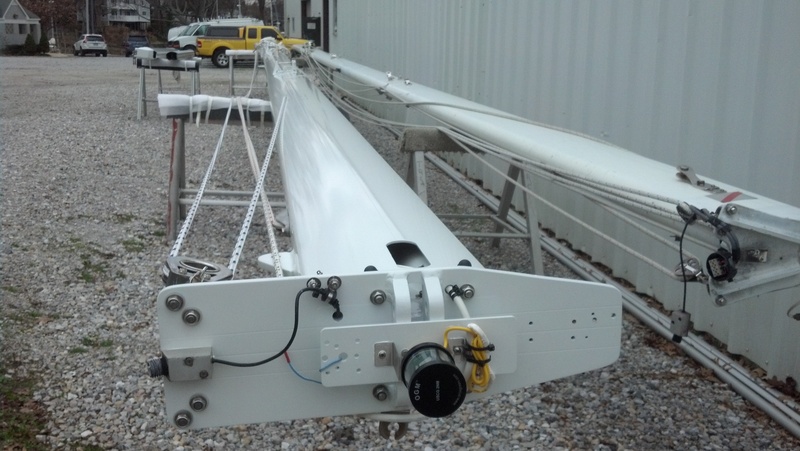 We see mast mounted radar brackets typically powder-coated, and the finish on those is usually worse than the rest of the gear. Those are our thoughts. Thanks for the comment. I have a Hall Carbon spar in need of a new clear coat. The finish is flaking in places and I was thinking of sanding it but not sure how to go about it. I just didn’t want to sand it to aggressively I also was wondering what product to use to re clear it, I heard on some thread that Hall uses the same formula as rustoleum clear UV. We've done a few of these. The easiest method is to just abrade the surface remove all loose old finish and feather-in aything that is attached still. The prime over it with and epoxy primer followed by black Polyurethane top coat for UV barrier. We would use AwlGrip products for this. If you want to stick with a clear finish because you want to see the twill and laminate patterns through the finish, you'll need to remove ALL of the old clear coat first. Do this by scraping any loose stuf then aggressivly sanding the attached spots. Try and stay away from the edges so that your not burning into the carbon, a few misses are okay. Then go over everyhting with something to abrade the surface evenly with no less than 120. Then with all of the old clear removed (may take some doing), use a clear epoxy primer and the a clear polyurethane top coat. Thanks for asking. Hope that helps. I have an 85 Endeavour 35 with a Kenyon mast and boom. The boom was very scratched and chipped so I sanded it all down with a 220 grit. What should I now use to seal it? I am not planning on re anodizing it. What primer and and cover coat do you suggest, or can I just seal it in something clear? Thanks for asking. We would remove all hardware and dissimilar metals. 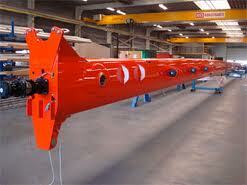 Sand with 80, 120, deal with any corrosion spots, and then 180(or220) to finish. You can also have the entire spar bead blasted first (skip the 80). 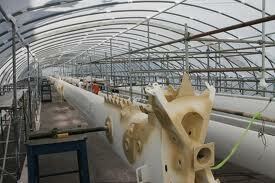 Before paint we would thoroughly wash the spars with an acidic solution and then soap and water. To answer your question, The paint process starts with epoxy primer as a moisture barrier and then a polyurethane topcoat is applied for UV protection. ….it is total of 4-6 coats of stuff. Do you ever recommend not painting the aluminum, and instead, sanding it with 800 grit, and then polishing it with aluminum polish? You can certainly, it is just more maintenance, doesn't last that long. But it looks SWEET! I have a 1985 caborico 38 in need of a whisker pole car, car nylon liners, and a winch mount base. I am located in the Hiroshima Japan area. Can you provide me with any way to locate these parts? Glad to help. We can provide car and liners. Can you send a picture of track and measure the width of it? What is the diameter of the winch base? You can email Jimmie@theriggingco.com. Thanks.